Dr. Emamekhoo is a medical oncologist with clinical and research focus on genitourinary malignancies. His previous research in gene targeting has evolved into an interest in a personalized approach to cancer treatment and precision oncology. 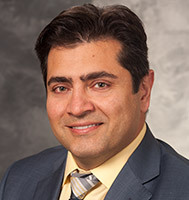 He is enthusiastic about immunotherapy innovations in cancer treatment and currently serves as the principal investigator, or co-investigator, on multiple ongoing clinical trials using immunotherapy and targeted therapies in different stages of kidney, bladder and prostate cancer at UW Madison.